An environmentaly safe, non-harmful to the marine environment, phosphate-free, high concentrate laundry detergent with naturally derived plant softeners and cleaning agents. 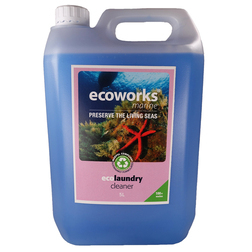 An environmentaly safe, non-harmful to the marine environment, phosphate-free, high concentrate laundry detergent with naturally derived plant softeners and cleaning agents. This environmentally safe washing machine detergent is ideal for sensitive skin and can be used at low washing machine temperatures where it provides excellent cleaning results with natural ingredients. This clothes washing machine liquid is compliant to MARPOL Annex 5 1.7.5 and is declared not harmful to the marine environment. Enivronmentally friendly formula including natural softeners and cleaners. Incorporates naturally derived surfactants from renewable, plant-derived sources such as sugars, palm/coconut oil and natural alcohols. Provides excellent cleaning results, even at 30-40 degrees. Concentrated formula, just 50ml per wash cycle is requied. Can be used for hand washing garments too.